Do I get training with Tuple? Self-paced learning resources are supplied in easy to follow language, with step by step instructions as well as videos to guide you through how to setup and start using Tuple. One-on-one training is not available with Tuple. What support do I get with Tuple? The Tuple help centre has hundreds of help articles with step by step guides on how to use all the features of Tuple. If you can’t find the article you’re looking for or are unable to move forward, a live chat facility is also available for you to ask questions to the Tuple team. One-on-one phone support is not available with Tuple. What is included with my data migration? We will import your student personal (name, address, date of birth, etc) and standard student AVETMISS data. Data such as student course enrolment information, documents, file notes or other custom populated fields are not available for import. Tuple will request a copy of your data for inspection prior to import to confirm the data can be migrated. What types of RTO is Tuple suitable for? Tuple is designed to help small RTOs manage their data in an easy, organised and secure way while complying with national AVETMISS reporting standards. Tuple does away with cumbersome Excel spreadsheets and provides superior data security. Unlike desktop applications, Tuple is 100% Cloud which means we take care of backups, updates and security so you can do what you do best! 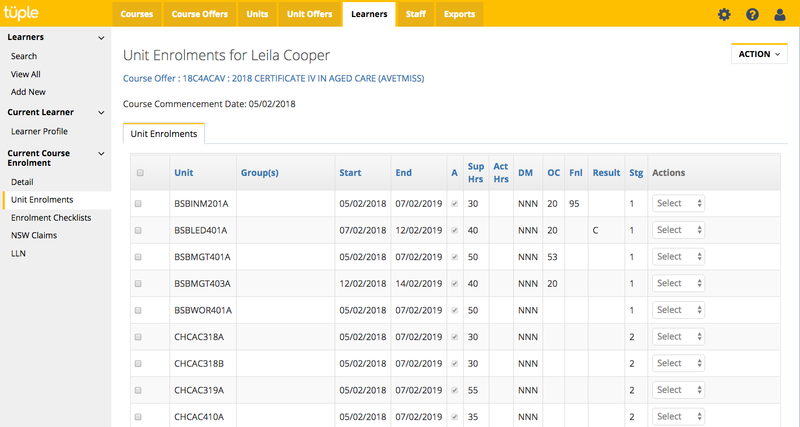 Tuple can be used to manage accredited and non-accredited training data for both full qualifications or short courses. 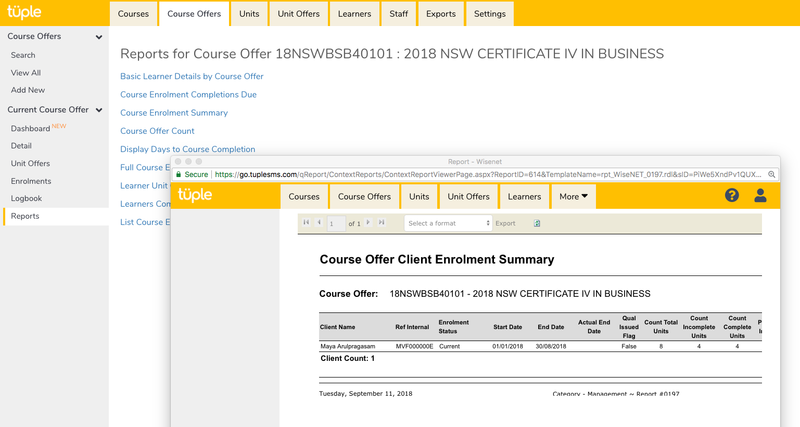 Tuple is not suited for use by international (CRICOS), higher education providers (such as VET Student Loan) or other funded training delivery. These types of providers may wish to consider Wisenet Learning Relationship Management which contains all the necessary functionality to manage these types of students. What compliance reports are available in Tuple? Tuple allows RTOs to collect and manage AVETMISS data and run standard AVETMISS compliant exports for all Australian States and Territories including National (NCVER) exports. 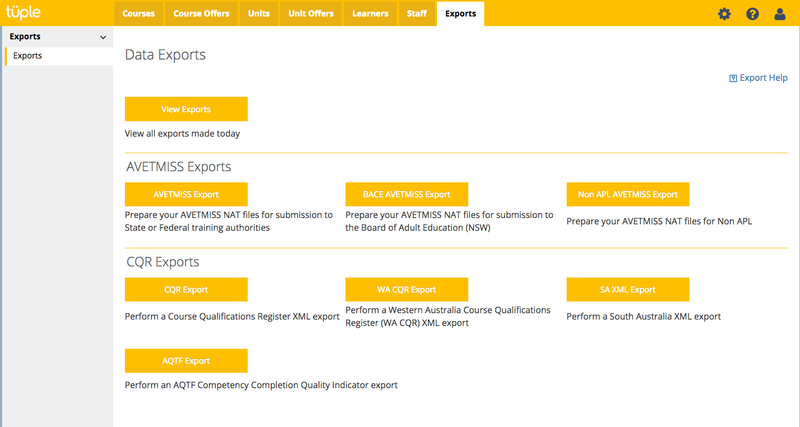 Tuple also contains BACE AVETMISS and Non-APL AVETMISS exports as well as exports for CQR, WA CQR, SA XML and the AQTF Competency Completion Quality Indicator export. How many users can access Tuple? Can I assign different user access levels? Tuple includes two levels of user types; Portal Administrator and Administrator. Both user types have full access to all areas of the Tuple application. A Portal Administrator is able to add, edit or remove user accounts. Tuple does not include user accounts for other stakeholders such as trainers or agents. For this level of functionality, you may wish to consider Wisenet Learning Relationship Management. Are there any management reports in Tuple? Yes. Tuple has a selection of management reports that can be run from various areas of the application based on the user’s current activity e.g. 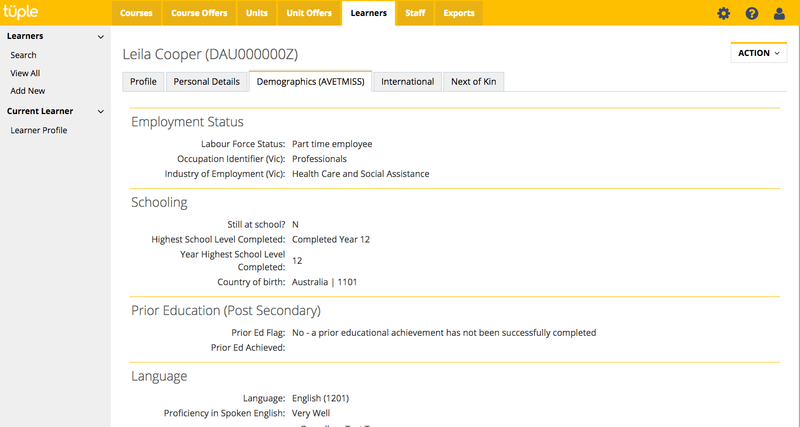 when looking at a student’s profile, the reports available will show the data for that particular student. Advanced features such as filtering criteria and custom date ranges or customised reports are not available in Tuple. Can I integrate Tuple with other software systems? No. Tuple does not include integration with other software packages. If you are looking for an integrated solution, may wish to consider Wisenet Learning Relationship Management. Can I upgrade from Tuple to Wisenet? Yes. You can upgrade to Wisenet at any time and all of your data and documents will be migrated. Visit wisenet.co for more about Wisenet Learning Relationship Management. What is the billing structure for Tuple? Tuple has two billing (or subscription) options; a month to month option where you can cancel your subscription at any time, or an annual subscription which is still paid in monthly instalments, but you have a minimum subscription commitment of 1 year. The annual subscription (called the Value Plan) does not have an initial setup fee, includes more Active Students and has a lower cost for additional Active Students. All Tuple billing is maintained via automatic monthly credit card deductions. It is important that you let us know if you credit card has expired or you need to change credit cards. Please ensure you have sufficient funds available to cover your base subscription and any additional Active Student charges each month. Payment failure will affect your access to Tuple. How does the Active Student count work? Depending on which edition of Tuple you subscribe to, you will have a base number of Active Students included with your subscription. You manage which learners are Active in their Tuple record. A record must be active in order for you to make any change or update to a Student’s data. If the student is not undergoing any training activity or has completed, you can set the record to Inactive and the Student will not be included in the monthly Active Learner count. You will still be able to view all Inactive Student data at any time. Additional Active Students are billed monthly in arrears in addition to your base subscription fee: At the end of each calendar month, Tuple will run a count across your database to collate the number of Students who were active in that period (a record will only be counted once regardless of the number of times they were switched from Active to Inactive that month). This number will be added to your next monthly credit card charge automatically in addition to your base subscription fee. It is your responsibility to ensure diligence in managing your students status’ so you are not paying more than you need to. In order to offer high availability of the Service to customers, Tuple operates in at least two Amazon Data Centre Regions, including Australia and Singapore. Tuple takes multiple data backups daily to ensure that your data is adequately stored and replicated. Looking for a system with more advanced functionality? Visit Wisenet or call us on 1300 365 384. No nonsense features for busy people! Unlimited access to easy to follow user guides and help articles or ask our friendly team your question via our online chat facility. Grant unlimited access to everyone who needs it. All Cloud. All Hosted. All Included! Forget about installing software, downloading updates or backing up data. We take care of it all so you can focus on doing what you do best! Produce AVETMISS files for all states and territories in a click! 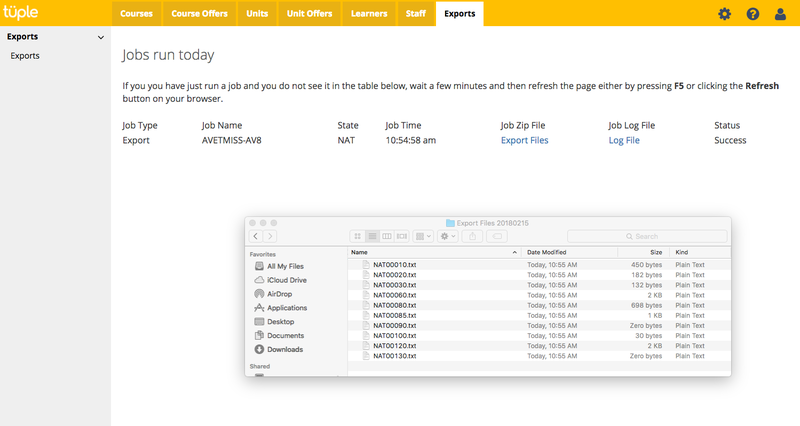 Import your existing student personal and AVETMISS data from Excel, VETtrak, iCare, NAT Files or other databases. 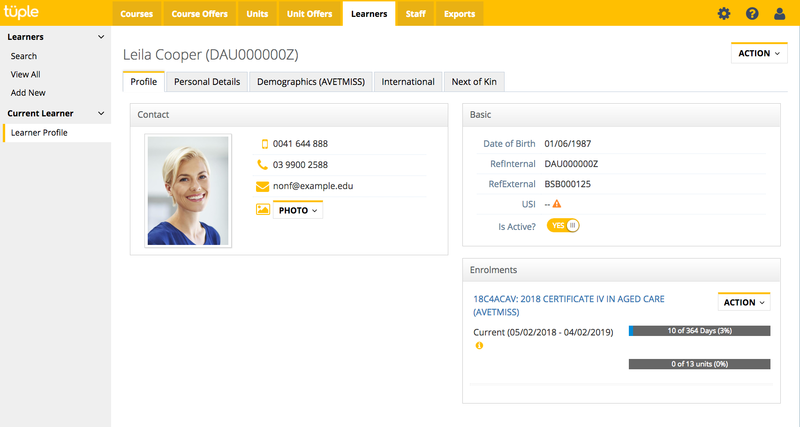 Quick and easy management of your student’s personal details, USI, course and unit enrolments and results. Keep track of your admin team, trainers and assessors. 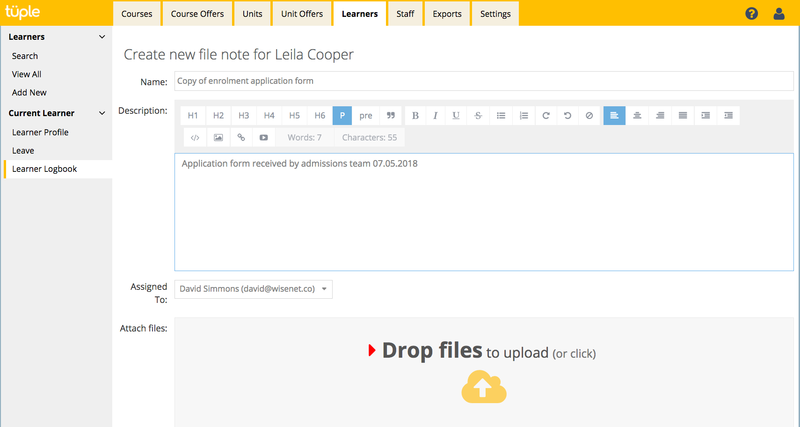 Record file notes & upload documents chronologically stored against each student’s profile. Produce reports and export to PDF, Excel and CSV. Mac, PC, tablet or smart phone; keep track of your business anywhere, any time and on any device. Easily produce CQR, XML and AQTF exports to meet compliance requirements. Pay only for students who are Active. Inactive students are free in all tuple editions. “Claim” means, in relation to a person, a claim, demand, remedy, suit, injury, damage, loss, cost, liability, action, proceeding, right of action, claim for compensation or reimbursement or liability incurred by or to be made or received by or against the person. “Conditions of Use” means these Terms and Conditions of Use. information which the Recipient can prove it lawfully possessed before obtaining it in connection with this Conditions of Use. “Data” means but is not limited to publicly available data, programs, information and other works and materials accessible on the Internet Service, including without limitation, web sites and pages and web delivered software and other applications. “Intellectual Property Rights” includes all present and future rights in relation to copyright, trade marks, designs, patents or other proprietary rights, or any rights to registration of such rights whether created before or after the date of this Agreement, and whether existing in Australia or otherwise. “Log-In” means the identification and password provided to You or Users by Tuple or any other identification that Tuple provides to You in its absolute discretion at any time. Tuple reserves the right to ask You to reset or alter its Log-in at its absolute discretion. “Moral Rights” means the moral rights granted under the Copyright Act 1968 (Cth), and any similar rights existing under foreign laws. “Personnel” of a person means that person’s directors, officers, employees, agents, contractors, sub-contractors and their respective personnel. “Training Organisation” means the Training Organisation to which the User is an affiliate or Personnel. “Service” means the service provided by Tuple to the User. “User” means any person who is a user of the Service. “You” and “Your” means the User. “includes” in any form is not a word of limitation. 2.1 In order to access the Service, You will be required to provide information (such as Your identification and Your contact details) as part of the registration process for the Service, or as part of your continued use of the Service (“Registration Information”). Once You have provided Tuple with the Registration Information, Tuple will provide You with Your Log-In information. 2.2 Tuple will supply and You will use the Service on the terms of these Conditions of Use. 2.3 Tuple grants the User a non-exclusive, non-transferable licence to use the Service subject to the terms and conditions of these Conditions of Use. 2.4 You acknowledge and agree that You cannot make a request or claim any compensation with respect to any issue arising from or in connection with the functionality of the Service. 2.5 You agree that in using the Service, You must comply with all reasonable directions with respect to the use of the Service, including the installation of updates, which are issued by Tuple from time to time at its absolute discretion. 2.6 You acknowledge that Tuple may terminate Your access to the Service at any time if it has reason to believe the terms of this Conditions of Use have been breached. 3.1.6 Use the Service to engage in or permit disruptive activities, including but not limited to, circulating any unsolicited publicity or advertising material, propagation of computer worms and viruses, use of the Service to gain unauthorised access to any other computer system, sending harassing, obscene, offensive or threatening electronic mail, forging electronic mail and placing, transmitting or storing any defamatory or pornographic material on the internet. 3.1.8 Knowingly access or permit any other party to access the Service for or in connection with any purpose or activity that is illegal or fraudulent in nature, including but not limited to, using the Service to aid the commission of a crime, the transmission of SPAM, chain letters and mail bombs or infringe upon the rights of a third party. 4.1.11 Not attempt to gain unauthorised access to the Service or related systems or networks. 5.1.1 Tuple is the sole proprietor of and retains all Intellectual Property Rights (including but not limited to copyright) embodied in or connected to the Service, including but not limited to, any images, graphic, website or program design, photographs, animations, video, audio, music, text, objects and ‘applets’ incorporated into the Service products, any related documents or software, whether in their original form or otherwise. 5.1.2 Except as expressly permitted by applicable law, You must not broadcast, publish or republish, up-load to a third party, transmit, post, show or play in public, distribute or otherwise reproduce in any format, adapt or change, alter, reverse engineer, modify, translate, decompile, disassemble or create derivative works of the Intellectual Property Rights and the Service without Tuple’s prior written consent. 5.1.3 Nothing in this Agreement affects the ownership of Moral Rights in the Service. 5.1.4 You acknowledge and agree that this clause has permanent effect. 5.2.2 The Content is Your sole responsibility and Tuple has no ownership, control or responsibility to You or to any third party for any Content which may infringe any Intellectual Property Rights of a third party. 5.3.1 Tuple’s Intellectual Property Rights are used by You with Tuple’s consent pursuant to these Conditions of Use. 5.3.2 Tuple reserves the right to terminate Your right to use Tuple’s Intellectual Property Rights at any time.5.3.3 Immediately upon Tuple notifying You of the termination of Your entitlement to use the Service, You must cease using the Service and Tuple’s Intellectual Property Rights. 5.3.4 You agree that You shall not do any act or thing in relation to data which would cause Tuple to infringe any party’s copyright or Intellectual Property Rights. You acknowledge and accept that Tuple shall have a royalty-free, worldwide, transferable, sublicenseable, irrevocable, perpetual licence to use or incorporate into the Service any suggestions, enhancement requests, recommendations or other feedback provided by You relating to the operation of the Service. 6.1.1 Neither party may, without the prior written consent of the other, disclose the other party’s Confidential Information unless it is compelled to do so by law. 6.1.2 Each party will take all reasonable steps to ensure that its Personnel engaged for the purposes of this agreement, do not make public or disclose the other party’s Confidential Information. 6.1.3 Notwithstanding any other provision of this clause, a party may disclose the terms of these Conditions of Use (other than confidential information of a technical nature) to its related companies, solicitors, auditors, insurers and accountants. 6.1.4 This clause will survive the termination of this Agreement. Will take all necessary steps to protect personal information in its possession against misuse or loss. 7.1.2 For the purpose of this clause, “personal information” means information or an opinion about an individual as defined in s 6 of the Privacy Act 1988 (Cth) which is collected, used, disclosed, stored or handled by the supplier for the purposes of this Agreement. 7.1.3 You acknowledge and understand that Tuple may, from time to time, be required to contact You using Your personal information in relation to Your access to the Service or other Tuple products to which You have subscribed. 7.1.4 You acknowledge that Tuple may, from time to time, send You marketing material. You acknowledge and agree to your personal information being used to contact You for the purpose of marketing activities of Tuple or its affiliates. 7.1.5 Tuple warrants that You may be removed from marketing communications at any time upon Your request to Tuple. Without prejudice to any other rights, Tuple may terminate Your use of the Service if You fail to comply with these Conditions of Use. 8.2.1 In the event of termination, You must stop accessing the Service and all of its component parts. 8.2.2 Termination or expiry of this Agreement will not affect the operation of any accrued rights or liabilities of either party, nor any provision of this Agreement which is expressly or by implication intended to continue in force after such termination. 9.1 You acknowledge and understand that Tuple makes no warranty to You as to the functionality of the Service. 9.2 You agree and acknowledge that You cannot make any requisition or claim any compensation for any defect or unavailability of the Service. 10.1.1 Tuple is not liable for any loss or damage as a result of a delay or failure in performance under these Conditions of Use regardless of the cause. 10.1.2 All warranties, conditions and representations, whether express or implied (other than express warranties stated by Tuple in writing), are excluded except where Tuple is by law unable to exclude or limit liability. To the fullest extent permitted by law, Tuple is not liable to You for loss of profit or other economic loss, indirect, special, consequential, general or similar damages arising under any order, or for negligence by Tuple, or for any Claim made against You by any other party even if Tuple has been advised of the possibility of such Claim. 10.1.3 You expressly acknowledge and agree that Tuple, its Personnel, affiliates, contributors, third party content providers and licensors are not be liable to You for any direct, indirect, incidental, special consequential or exemplary damages incurred by You, however caused and under any theory of liability. 10.1.4 You will indemnify Tuple in respect of any Claim, action, damage, loss, liability, cost, charge, expense, outgoing or payment suffered or incurred by Tuple (including, but not limited to, economic loss and all legal costs and disbursements on a full indemnity basis) caused by You and/or any wilful, illegal or negligent act or omission by You. 10.1.5 You acknowledge that Tuple is not responsible for assisting You with support services in respect of Your use of the Service. Agreement, without the prior written consent of the other party. This Agreement must be read in conjunction with the Agreement, and when combined, those documents supersede all prior agreements, arrangements and undertakings between the parties and constitute the entire agreement between the parties relating to subject matter. Tuple reserves the right unilaterally vary this Agreement from time to time in its absolute discretion by providing reasonable written notice to You of the variation. You acknowledge and agree that publication of any changes made by Tuple to this Agreement on Tuple’s website will constitute reasonable notice to You of those changes. If any clause or part thereof in this Agreement is held to be unlawful, invalid, unenforceable or in conflict with any rule of law, statute, ordinance or regulation, it is to be read down to the extent required so its validity and enforceability and the validity and enforceability of the remaining provisions are not affected. This Agreement is governed by and construed in accordance with the law of Victoria and the parties submit to the jurisdiction of the courts of Victoria.